It's quite clear. Half voted for more eatery reviews. 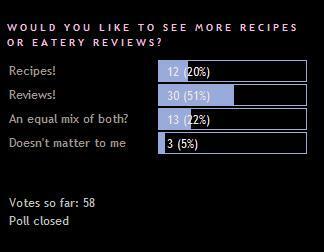 The other half are split between more recipes and equal mix of both. So I guess I shall continue with mostly reviews and the occasional recipe or two. Meanwhile, I'm starting a new poll - which celebrity chef would you like as your personal cook? Pick your favourite three!